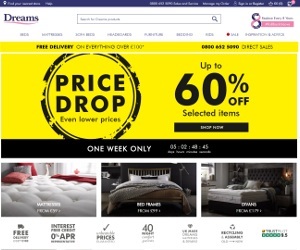 Dreams was established in 1985 and is now the UK’s number one bed specialist, they retail beds, mattresses, sofa beds, bedding and much more. As a specialist they are able to go deeper in their product offering, much more so than other homeware retailers. To put Dreams into perspective, they sell over 10,000 mattresses a week which is a huge amount. Dreams are most popular for their mattresses but they also sell the bed frames at affordable prices. They often run 50% discounts across the site and we will list when these discounts are made active. Worried about delivery charges? Dreams offer free delivery on orders over £100 which puts alot of minds at ease, especially considering the size of these products. If you are in the market for a new bed or bed accessories, Dreams will have the choice whilst offering competitive prices. We notice they often run timed deals specific to products too, so aswell as the broad sale message they also discount individual products and provide the length of the deal.